In 2006, 5.2 million children and youth under the age of 25 lived in 14 of the country’s largest urban areas. 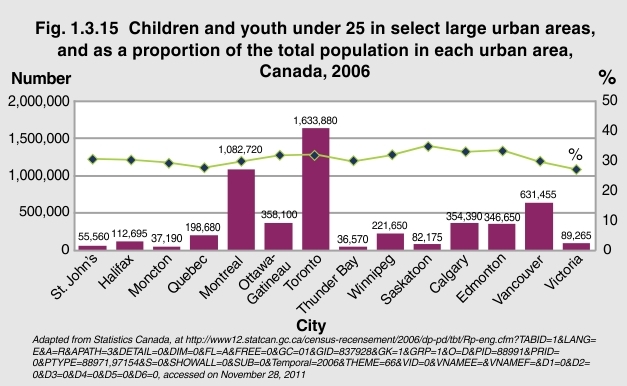 Of these children and youth, 64%—or 3.3 million young people—lived in Vancouver, Toronto and Montreal. The children and youth in these 14 urban centres accounted for 31% of the total population. This proportion was fairly consistent across cities, from 27% in Victoria to 35% in Saskatoon. The proportion of the population that is under age 25 is comparable in each city. Cities must be able to accommodate the needs of youngsters as they develop, learn and grow.